One of my favorite things about summer is the selection of fresh berries! 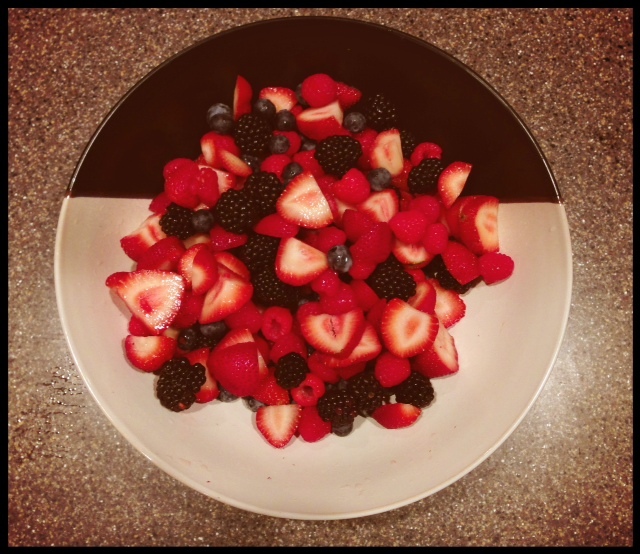 Blackberries, blueberries, and raspberries are my favorite! It made sense that thick, enormous pieces of red meat took a lot longer for your body to break down … and therefore, were much harder on a healing gut. The idea that things like baked goods, and grains worked like a sponge in the digestive system – often soaking up fluids and then making a brick of sorts – very difficult to pass. You would think, with a diet of steamed vegetables, veggie juices, limited fruit and organic meats that your digestion would be a dream. Right? I thought mine would be… but it’s been a struggle. I know meats high in fat, such as bacon (that I dearly loved) were a nightmare for my digestive system. Raw veggies were also extremely tough on my stomach… so I’ve tried making adjustments. Steamed and cooked veggies only, very limited on the red meat and bacon. But I need to eat frequent, smaller meals, or I’m in a world of pain… and it’s an issue that piggy backs throughout the day if I’ve over eaten (yes, even veggies) or venture off and have grass-fed red meat, a bite of bacon or raw veggies. My body likes to remind me – just who is in charge. My stomach isn’t emptying like it should. My goal becomes to drink my warm BRAGGS and MSM before bed – allowing time for my digestion to soften and break down things while I’m sleeping… If this doesn’t work, I’m often in discomfort, and as you might imagine, not hungry even though I need sustenance. Gastroparesis. This often occurs when the vagus nerve is damaged by either illness or injury and the stomach muscles stop functioning normally. Food will move more slowly from the stomach to the small intestine or can stop moving altogether. So, what causes this? It’s common in people who have diabetes and auto immune diseases like Parkinson’s or MS. For me, I feel like it is just one more MS sign and it probably resulted from my gut being inflamed for so long – day after day. It could be from blood sugars being off when I was not digesting any number of foods that caused issues to my body. Regardless, of the cause – it’s painful, and can be very dangerous. I just had a bad episode of this Monday, following a few bad choices I made on Saturday. I had bacon (too much fat! ), and I also had a raw veggie salad that had lots of carrots and celery (too hard to digest). I thought with having the MSM, I would try these things again – and see if my body might deal more kindly with them. By Monday, I was in misery. I ate a small meal for breakfast, and plant protein shake for lunch. By dinner I was just feeling SO bloated, even though I’ve lost weight in the past weeks now that my hormones are getting back in line. It feels so miserable not to be able to back up, and change the mistake you made a few days prior. Frustrating. A word that comes to mind when I think of being on a diet that requires me to get lots of good fats for my brain – with a body that refuses to digest or absorb most fats! Avocados are my friend – daily. I also make sure I get lots of quality coconut oil, and olive oil in my diet. Uncooked raw veggies are kicked to the curb and I’ve been hitting the juice well this week attempting to get back on track! I’m super thankful for my MSM, but embracing my limitations so I can stay on track being healthy for Him! “When the righteous cry for help, the LORD hears and delivers them out of all their troubles. Posted on July 17, 2013, in Auto Immune Disease, Celiac/Gluten Sensitivity, Our Struggles and tagged celiac disease, Gastroparesis, gluten intolerance, healthy for him, MS, MSM, pain in digestion, stomach bloating, stomach not emptying. Bookmark the permalink. 13 Comments. Good info as always— I’m with ya on the “Avocados are my friend – daily. I also make sure I get lots of quality coconut oil, and olive oil in my diet.” mine also— & for my self– I do best with 4 to 6 small meals & or snacks–a day– & some days– my only meals are my Standard Process Complete– & my green drink with hemp oil– & an avocado– or banana!! And Lots & lots of pure water!!!!!!!!!!!! Thanks for sharing!!!!!!!! Always enjoy your blog posts!!! Amen – love of lemon water here!!! (And talking kindly to my liver!) 🙂 LOL. Doesn’t matter what I eat, always makes me sick. I have to drink Ensure a lot of the time. Good luck on your journey. So you have tried the autoimmune protocol diet? Have you tried sun warrior plant based protein? Do you see a naturopath? what is the autoimmune diet? Never heard of sun warrior plant based protein. I’m on disability and cannot afford a naturopath, wish I could. I have to be careful, I’ve tried several different supplements that I later found out I couldn’t take because of some other disorders I have. It’s a revised Paleo Diet, that takes out all inflammatory foods and encourages you to heal your gut – which is where these types of things are triggered. If you can’t afford a naturopath, it’s the route to go to figure out food sensitivity triggers and heal your body. Sun Warrior Plant Protein is much better for you than Ensure. GMO free, grain-free, and great with a banana and some coconut milk. Thank you so much for this information. I book marked the page so I can check it out tomorrow. I look forward to checking this out and hoping it’s something I can do. Thank you, again! PS – completely understand about certain supplements triggering other things, it’s happened to me quite a few times as my body became more sensitive. You definitely don’t want to be wasting money! I have gastroparesis, IBS, asthma, esophageal motility disorder, interstitial cystitis, fibromyalgia, chronic fatigue, factor V Leiden (blood clotting disorder), hereditary hemochromatosis and I’m sure I’m forgetting something. Of course, with all this, I also suffer from depression, anxiety, PTSD, and ADHD. One big problem is that the diet for gastroparesis is the exact opposite from the diet for IBS. What a mess. I’m miserable most of the time, but I do practice mindfulness and meditation and try to stay positive, The dark, bad, bad days are behind me. Don’t want to give up any more. I focus on a diagnosis then I’m not focused on healing my body inside our the way God designed us. Our body can repair and recover if we give it a chance. All we need is some hope. Another great site for encouragement is chrisbeatcancer.com. You certainly have a lot of challenges, but we serve a great God who can fill us up each day and show us what steps to take that day. Thank you so much for all the helpful info. and support. You truly are an inspiration to me. I’ll be following you. God Bless!